Exercise is integral in the treatment of debilitating conditions such as diabetes, cardiovascular diseases, obesity, back pain, and arthritic conditions. 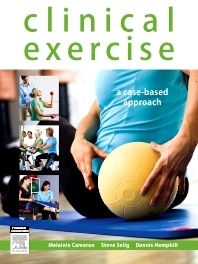 This new book presents succinct summaries of the evidence underpinning the use of exercise as therapy, and highlights through case studies the current challenges and complexities of clinical practice. This highly readable text also includes more than 30 comprehensive clinical cases exploring client presentations in the areas of cardiovascular, musculoskeletal, respiratory, neurological, metabolic and occupational rehabilitation. Clinical Exercise: a case-based approach will appeal to students and practitioners committed to evidence-based and reflective practice.